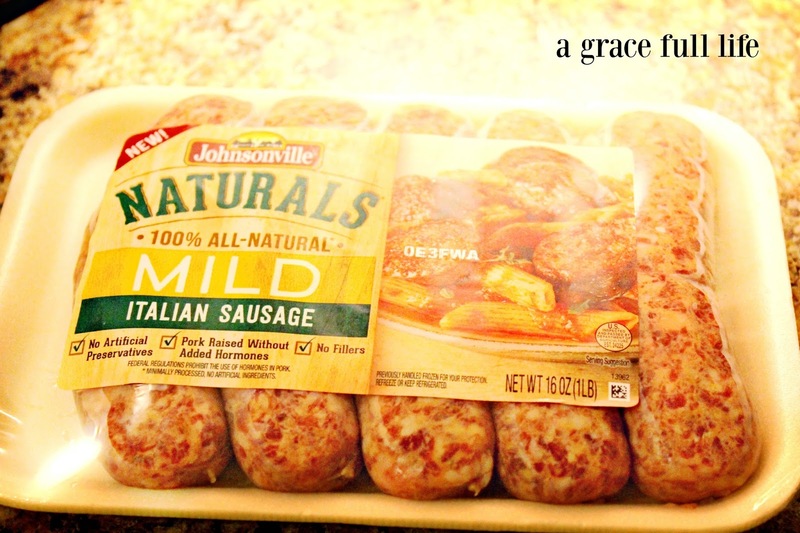 Johnsonville sausage is going to hate me for that title but I swear it means something good. Well, it won’t make me look good but it will totally make them look good. Even when I try to. I love Italian sausage a little more than I would like to admit. It started at the county fair many years ago and has seeped into my kitchen. 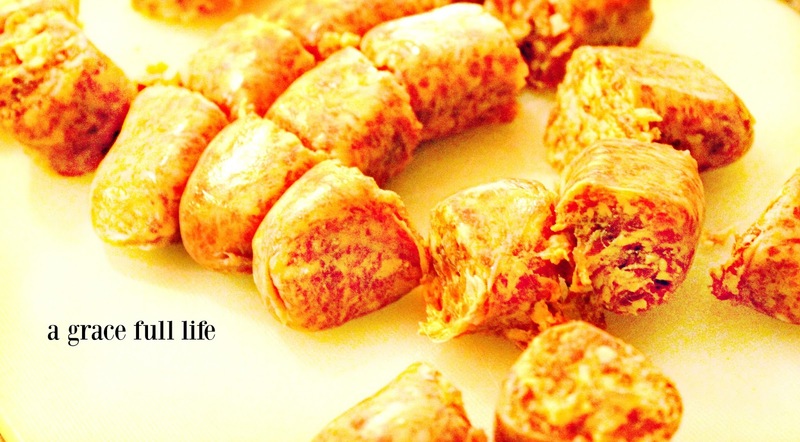 But over the years, I haven’t found a sausage that I love to cook with. Just okay sausage but nothing spectacular. Boy, I think I might have overused my sausage word quota in that paragraph. Basically good for you meats but with the taste that you would expect from America’s leading sausage brand. Also, know as my sausage soul mate. I can TOTALLY have a sausage soul mate. 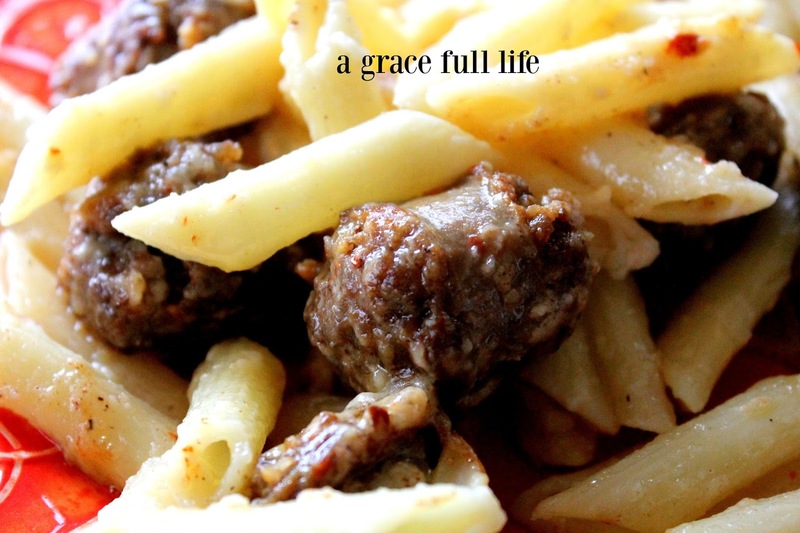 So you are in for a treat today because I am here to share with you a recipe that I have held near and dear for years. I actually don’t know why I have never shared it here on the blog before because it is so dang good. 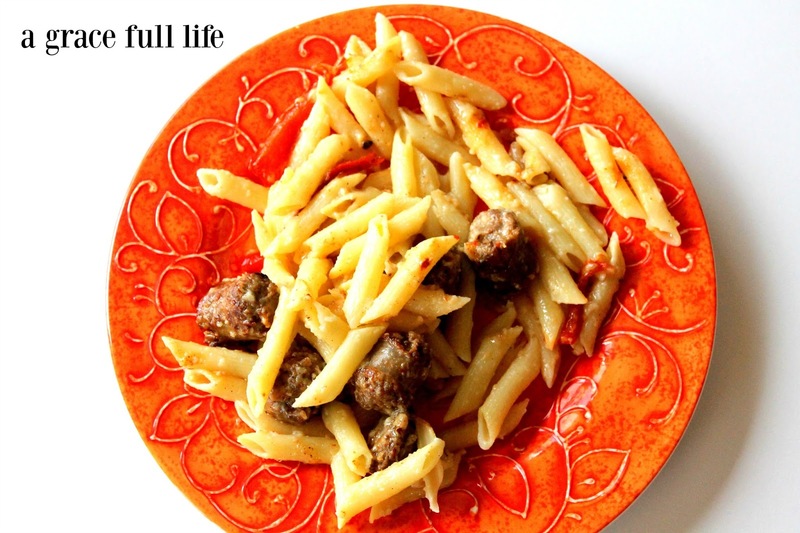 Pasta Alfredo with…..wait for it…SAUSAGE. And I can’t wait to try my new soul mate sausage with it. OMG, that sounded so dirty. The beauty of this recipe is that as amazingly good as it is? It is even better the next day. Why do I say embarrassingly good? Well because this pasta dish will make you do embarrassing things. But I don’t blame the pasta dish. Because I never did anything embarrassing before this sausage came into my life. I mean, I love this Alfredo dish but when I would re-heat it the next day, I would just put it in a bowl, hit the microwave buttons and eat. But after re-heating this the next day, a piece of soul mate sausage rolled off of my plate and onto my floor. Okay, totally under the dishwasher, but I reasoned it was clean under there. But, but, but, this sausage…..I mean……it is so good. I must not miss one piece. Plus there is that whole five-second rule thing OMG STOP JUDGING ME, YOU DO IT TOO. Bring water to a boil for your pasta. Cut up the sausage and brown in a pan with some olive oil (I only eyeball it but around two tablespoons or so). While that is browning, cut your red pepper into strips and add in with your sausage to saute. Once the meat is fully cooked, take off the heat and set aside. At this point, your water should be at a full boil, so pour your dry pasta in and let it begin cooking. Now on to the Alfredo sauce! It isn’t scary, I promise and this recipe is AMAZING. Your family will think you ordered in from a restaurant. Melt the stick of butter in a medium saucepan. Once it has fully melted, add the cream, garlic powder, and black pepper and simmer for 10-12 minutes. You will want to keep an eye on this and stir it occasionally during this process because it has a tendency to overtake the pot. DO NOT GET SCARED BY THIS. It just boils over sometimes so just stir here and there and keep your eye on it, that’s all. After the 10-12 minutes, add in the Parmesan. By the way, I had a Parmesan/Asiago mix in my fridge and used that instead so as long as it has Parmesan in it, you are golden. After you add in the Parmesan, make what is called a roux. Mix two tablespoons of flour with 1/4 of a cup of water in a small bowl. Add more flour if you need to because you want it to be a little thick in consistency. This is a roux and it thickens the Alfredo. Add it to the sauce and blend until no lumps show. 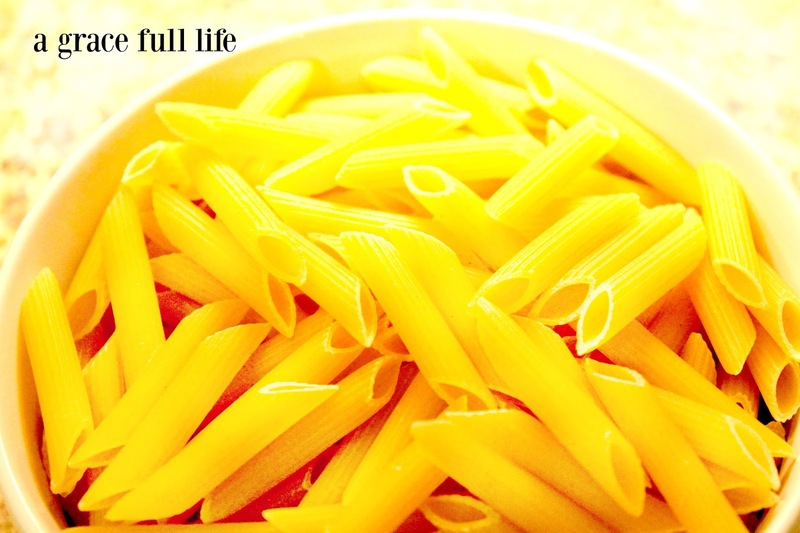 Drain your pasta then place back into the pot. 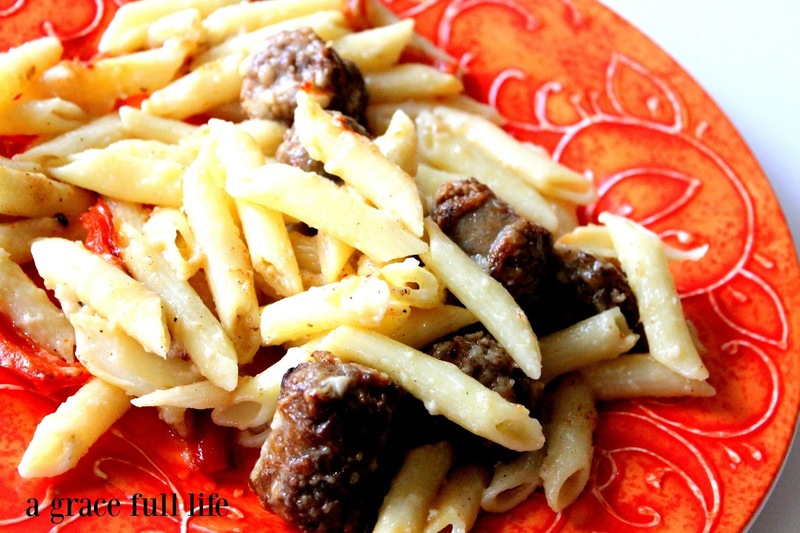 Add the Alfredo sauce to the pasta pot as well as the sausage and peppers that you set aside. Serve immediately because well, duh. And if your sausage rolls on the floor, eat it. It isn't scary, I promise and this recipe is AMAZING. Once it has fully melted, add in the cream, garlic powder and black pepper and simmer for 10-12 minutes. You will want to keep and eye on this and stir it occasionally during this process because it has a tendency to overtake the pot. It just boils over sometimes so just stir here and there and keep your eye on it, that's all. 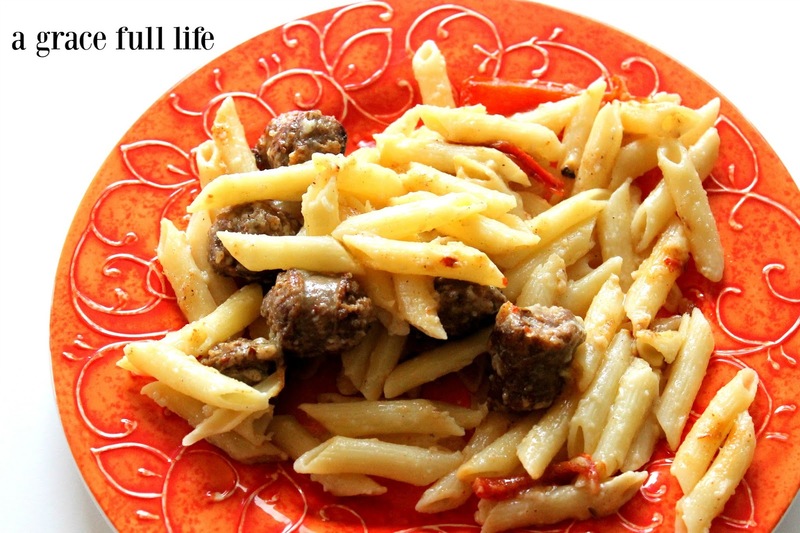 Add the Alfredo sauce into the pasta pot as well as the sausage and peppers that you set aside. Blend gently and serve immediately.